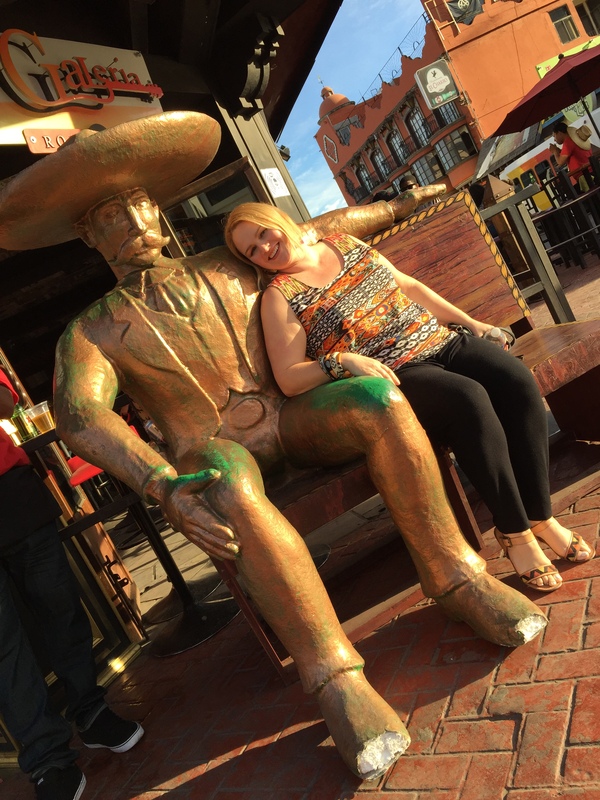 For many, Ensenada is town to get crazy in, drink a few cervezas (or 12), let your hair down and act a fool. 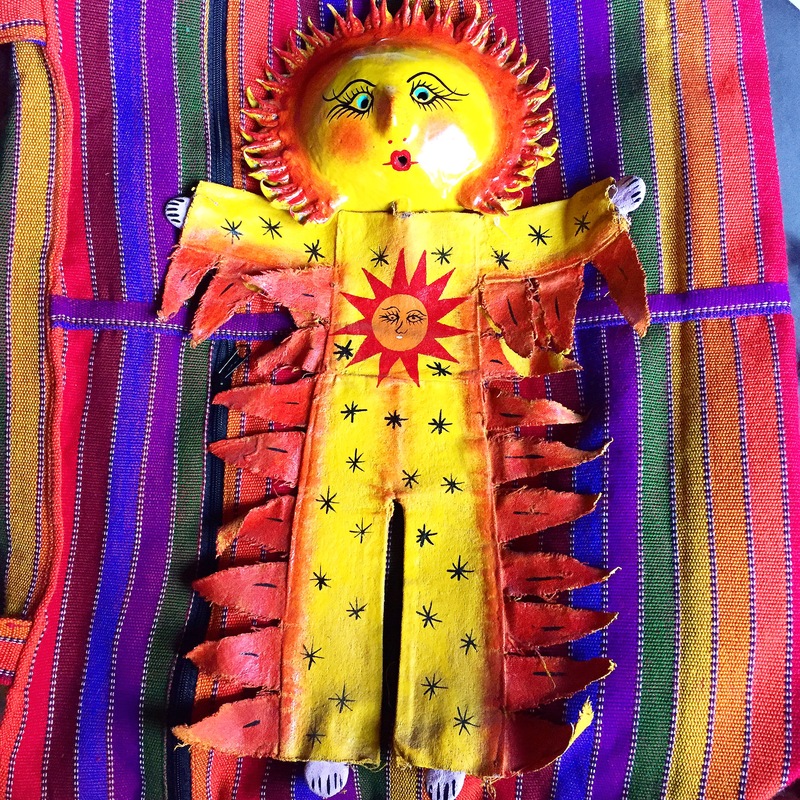 I recently stopped in Ensenada on friend’s birthday cruise and while we were there to party, I am always on the hunt for interesting and unique items. The main street of Calle Lopez Mateos is chock full of tiny cafes, street vendors and small shops. It’s short enough that you can stroll one side, browse the wares and come back to something you fell in love with, without having to go very far. 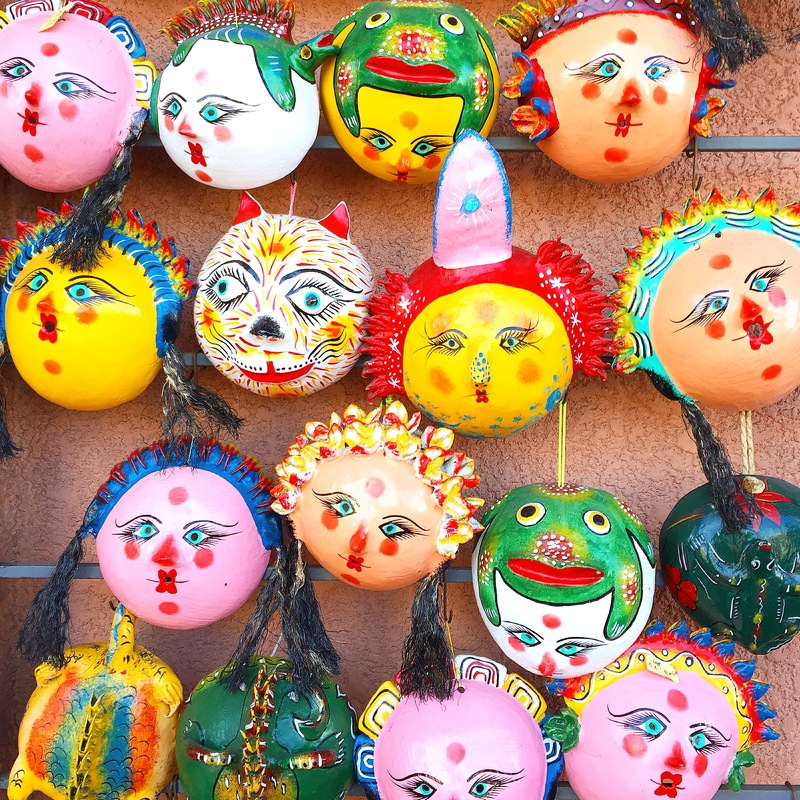 These little masks are made from coconut husks, hand painted and decorated. 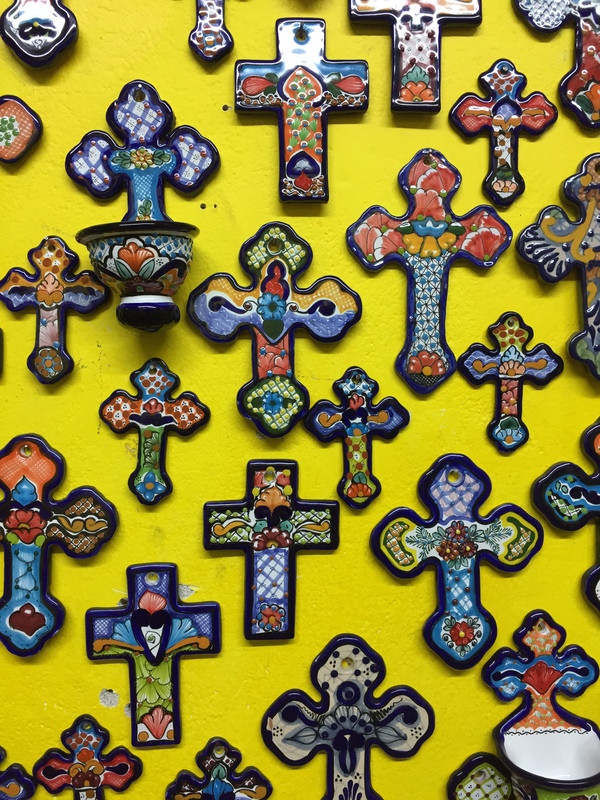 While some of the street vendors and shops are selling items that are traditionally Mexican, like hand tooled leather bags, turquoise and silver jewelry and sandals, many are selling tourist junk. Jewelry and handbags from China, sarongs from Indonesia, etc. The more places I travel, I am noticing this is becoming a common trend and it breaks my heart. 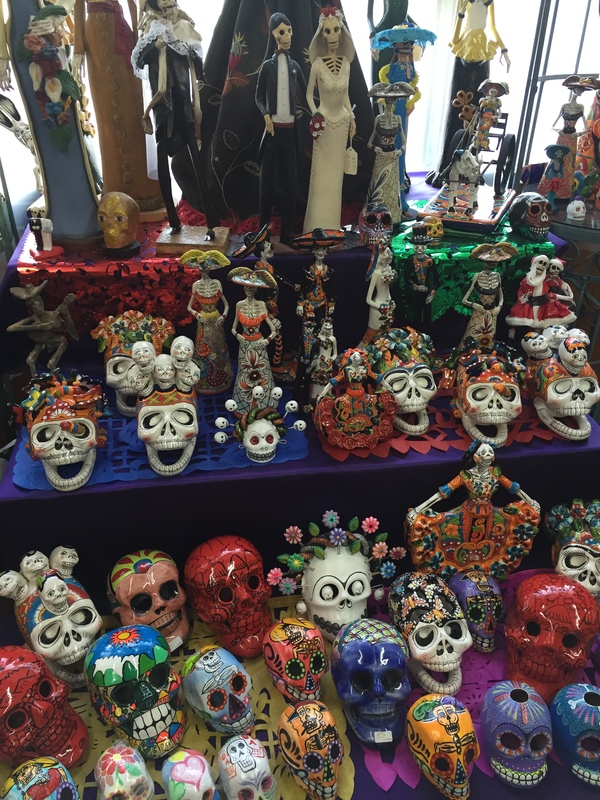 As we walked down the street, a colorful window, full of dancing Day of the Dead couples and metallic skull banners caught my eye and I had to stop. Little did I know I had discovered the most amazing, two story shop, selling handmade art and wares from all over Mexico. Jackpot!! 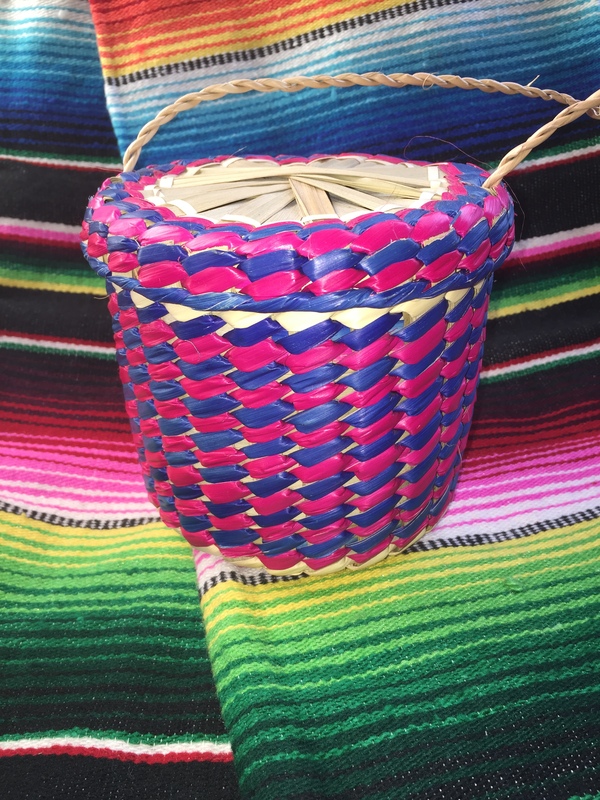 Bazar Casa Ramirez, carries all handmade products crafted from the hands of Mexican artists. 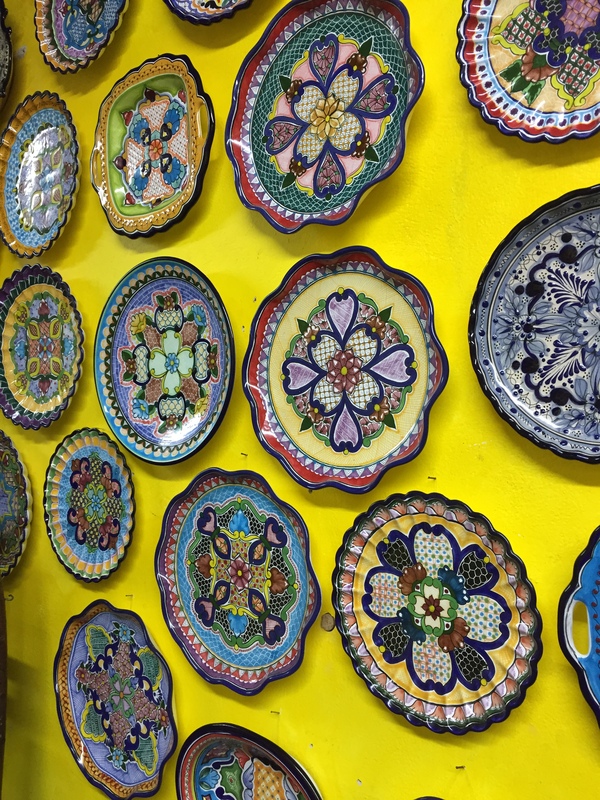 Different states and regional influences are found in the art dotting the walls, the dishes on the shelves and the bags hanging on the racks. This store is a feast for the eyes and the soul. 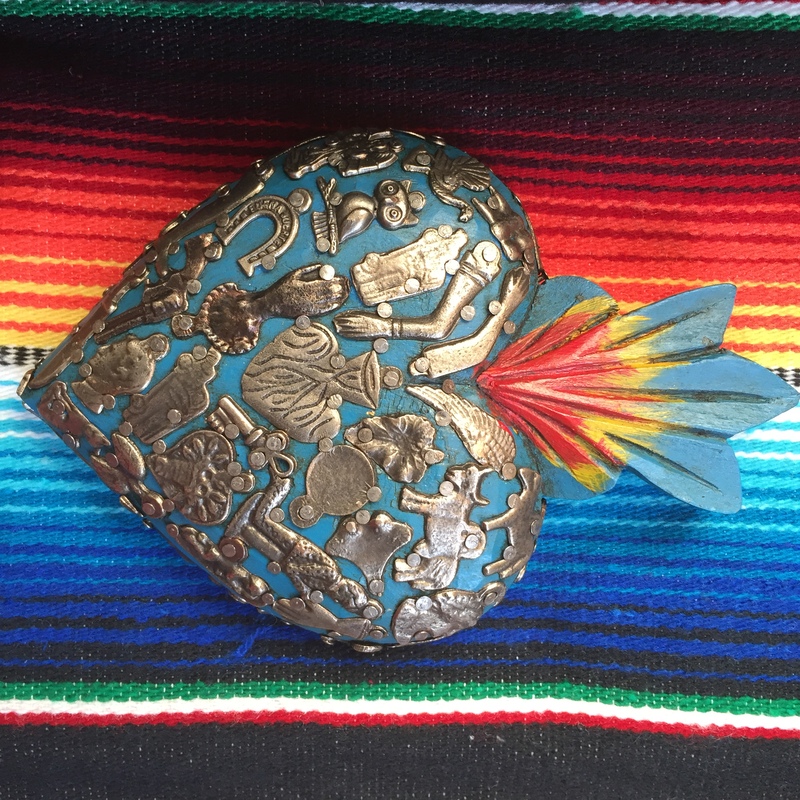 I was immediately drawn to these hearts, handmade in Michoacan. I loved the color and decorative metal pieces. It was explained to me that all the metal pieces are “Milagros” or miracles, used by the grateful to offer thanks for prayers answered. There are symbols representing fertility, health, happiness, safety, and you can rub the one you are in need of as you say your prayers. Being a person who lives in gratitude this piece really connected with me so I purchased it. I also loved these small straw bucket bags, which are made locally in Ensenada. It’s the perfect size to fit your essentials for traveling or a Summer music festival and I love the pop of color. I may change the strap to a longer one so I can wear it cross body. I fell in love with the coconut masks we passed on the street and they had a few in this shop as well. I’m a fire sign and a collector of masks so this little “Fire God” caught my attention and held it. He came home with me too! 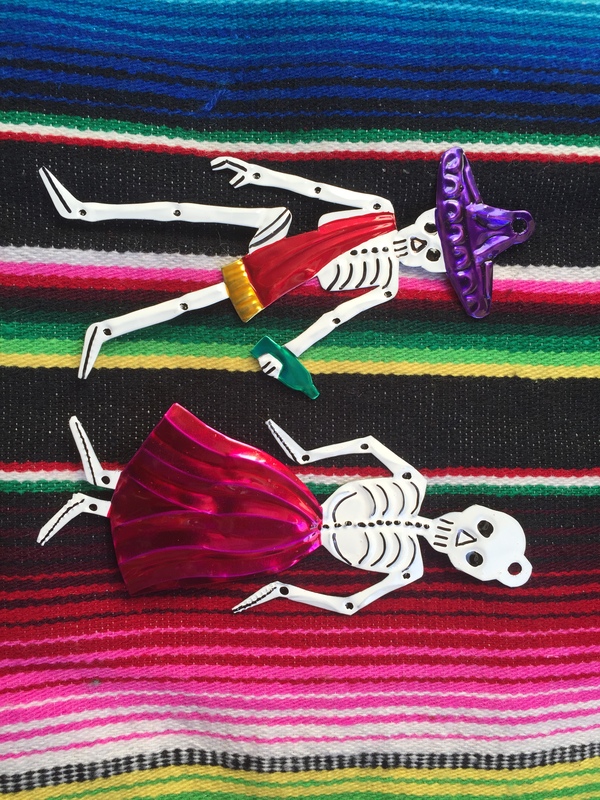 The last items I bought were these tin Day of the Dead ornaments, from Oaxaca, to add to my travel inspired Christmas tree next year. I bought all of these beautiful handmade items for less than $50 and couldn’t be happier with my treasures! Bazar Casa Ramirez is located at Calle Lopez Mateos 498-3, Edificio Ramirez, Ensenada, Baja California. They don’t have a website, so you’re just gonna have to get there in person! I promise, it’s worth the trip!